I originally wrote this paper for my Biological Systems class, the instructor of which was interested in researching the physiological role of monocarboxylate transporter 1 (MCT1). He instructed his students to write an essay exploring this role in any way they wanted, and I chose to focus on the link between MCT1 and cancer. I enjoyed sifting through multiple strands of evidence for the reasons behind this link — strands that oftentimes were not in agreement with one another. Monocarboxylate transporters (MCTs), as their name implies, are proteins that transport molecules with just one carboxylate group — such as lactate and pyruvate — across the cell membrane (1). This transport is proton-linked in that the concentration gradients of protons and monocarboxylates determine the direction of net transport (1). There exist several different MCT isoforms, each with different biochemical properties and functions (2). For instance, isoforms 1-4 play key roles in energy metabolism in the brain, skeletal muscle, and heart, in addition to T-lymphocyte activation and bowel metabolism of short-chain fatty acids (2). MCT8, on the other hand, aids in thyroid hormone transport across the blood-brain barrier, while MCT10 facilitates the transport of aromatic amino acids (2). 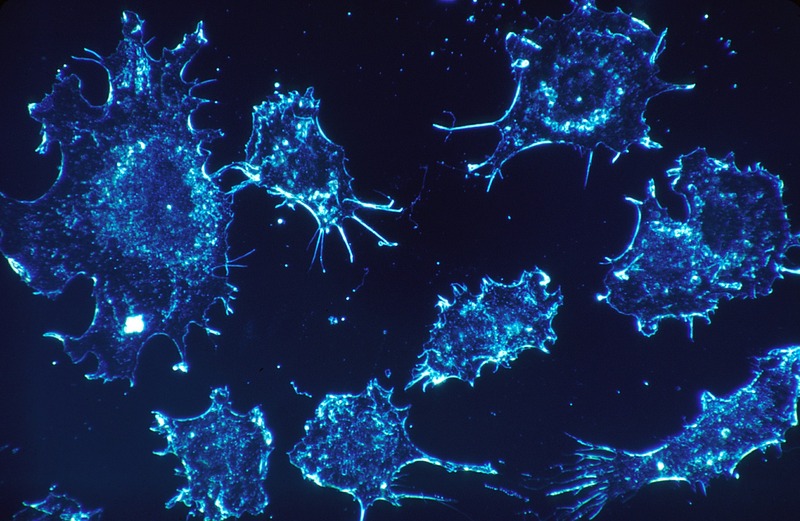 Notably, MCT1 in particular has been linked to cancer progression, and several mechanisms through which it does so have been proposed over the years (11-22). MCT1’s role as a pH regulator, lactate and pyruvate transporter, and growth and transcription factor activator may contribute to its ability to bolster cancer cell activity (11-22). Solid tumor cells in hypoxic microenvironments rely upon anaerobic glycolysis to synthesize ATP (3). Unlike normal cells, however, cancer cells have been observed to perform the metabolically inefficient aerobic glycolysis in the presence of oxygen (4). This phenomenon was coined the Warburg effect after Otto Warburg, who first reported it in the 1920s, and it has confounded scientists ever since (5). In the presence of oxygen, most cells rely upon mitochondrial oxidative phosphorylation in order to synthesize enough ATP to sustain themselves, as this pathway can produce up to 36 ATP molecules per glucose (6, 7). In glycolysis, by contrast, each glucose yields only two ATP molecules (7). This fact makes the Warburg effect seem paradoxical, as the rapid proliferation of cancer cells would indicate that they have high energy demands (4). Multiple explanations have been proposed for this phenomenon; whatever the reasons behind it, though, it is key that tumor cells exhibit a high glycolytic rate with or without oxygen present (7). In this context, MCT1’s relationship to increased cancer cell development and progression can be explored. The high glycolytic rate of cancer cells leads to the production of hydrogen ions and lactic acid among other things, the consequence being decreased local pH (8). Acidification of the intracellular environment has been linked to cellular apoptosis, as well as the activation of endonucleases that induce DNA fragmentation (9). Extracellularly, increased acidity has the opposite effect: it aids in the proliferation, invasion, and metastasis of tumor cells (9). As such, mechanisms to maintain the pH of cancer cells are necessary for their survival and success. Where MCT1 comes in thus becomes apparent given the importance of pH regulation in cancer cells: by shuttling lactate and protons, which are tied to cellular pH, MCT1 confers these cells with the ability to survive and even thrive in acidic environments (10). One way in which MCT1 provides an advantage to tumor cells is through pH regulation, an ability that goes hand in hand with its co-transport of protons. Beyond its maintenance of pH, MCT1’s transport of lactate in particular contributes to its correlation with increased cancer cell activity. As aforementioned, the increased glycolytic rate of cancer cells results in high lactate levels (7). In order for continuous glycolysis to occur, therefore, the transport of this lactate is essential (11). In this context, the association between MCT1’s role as a lactate transporter and its utility for cancer cells is clear (11). This association has been explored by Payen and colleagues, who found that lactate release decreased and intracellular lactate accumulation increased both when MCT1 was silenced and when it was deleted in cancer cells (12). Significantly, the glycolytic efficiency of the cells decreased when MCT1 expression was inhibited (12). Lactate itself has also been linked to tumors: not only is its abundance an indicator of metastases and cancer patient survival, but it also has been shown to facilitate cell migration and cluster formation (13). In other words, lactate level both reflects and increases cancer cell malignancy (14). The association between lactate abundance and tumor potency again points to the importance of MCT1’s ability to transport lactate. In addition to lactate, MCT1 transports pyruvate, and this aspect of it offers an alternative explanation for its boosting of cancer cell activity. In one study, Sun Hong and colleagues found that inhibiting MCT1 reduced pyruvate rather than lactate export in breast cancer cells (15). This study implies that MCT1’s role as a pyruvate transporter lies at the heart of its contribution to tumor growth (15). Sun Hong et al. began by examining gene expression to confirm the correlation between MCT1 and the glycolytic phenotype in breast cancer cells; thereafter they analyzed normal and malignant breast and lung tissues, ultimately determining that MCT1 protein levels were elevated in the malignant tissues (15). Following these initial findings, in order to investigate MCT1’s effect on metabolic phenotype, they generated breast cancer cell lines in which MCT1 expression was knocked down (15). The results suggested that MCT1’s mediation of pyruvate export is a key function for it in glycolytic breast cancer cells — and that its mediation of lactate export is not (15). Whether the same phenomenon holds true for other cancer types such as colon, lung, or prostate cancer has yet to be investigated (15). It should also be noted that the cancer cells used in this study expressed higher levels of another isoform, MCT4, than those in other studies (15). This fact may explain discrepancies between these studies regarding the mechanism by which MCT1 aids cancer cells. Still other researchers have found evidence that MCT1 confers advantages to cancer cells independently of its transporter activity. Gray et al., for instance, found an association between MCT1 expression and growth factor-induced tumor cell motility (16). In one study, Gray and colleagues knocked down MCT1 expression and subsequently observed a change in two signaling pathways, called the epidermal growth factor (EGF) receptor and hepatocyte growth factor (HGF) receptor pathways, both of which are important for the movement of tumor cells (16). Inhibiting MCT1, the researchers found, decreased the activity of both EGF and HGF as measured by the effects on tumor cell scattering and wound healing (16). Notably, the knockdown of MCT1 expression did not affect the net transport of lactic acid, likely due to redundancy between MCT1 and MCT4 (16). These results indicate it was MCT1’s relationship with the aforementioned growth factors that was responsible for the change in cell motility, a relationship independent of its activity as a transporter (16). Further studies have indicated yet another function for MCT1 in cancer cell metastasis beyond transport. These studies concern the nuclear factor-kappaB (NF-κB) pathway, which has been shown to play a crucial role in cancer development and progression (17). Through western blotting analysis, Zhao and colleagues demonstrated in one study that several human osteosarcoma cell lines express MCT1 (18). Thereafter they knocked down MCT1 expression in such cell lines and observed a suppression in cell growth both in vitro and in vivo following this knockdown (18). Moreover, they found that inhibition of MCT1 decreased other metastatic activities such as wound healing, invasion, and migration in osteosarcoma (18). In this study, Zhao et al. focused on NF-κB signaling to explain their findings, as its hyperactivation has been linked to the enhancement of tumor cell survival and metastasis (18). By either downregulating MCT1 with the specific inhibitor α-Cyano-4-hydroxycinnamate or suppressing it through RNA interference, they found they could decrease the activity of the NF-κB pathway, which in turn impaired the function of the osteosarcoma cells (18). MCT1’s ties to NF-κB thus play a part in its facilitation of cancer cell activity. Based upon the work of Zhao and others, Payen and colleagues further explored the connection between the NF-κB pathway and MCT1’s function with regard to tumor cells (12). They found that dosing carcinoma cells with the MCT1 inhibitors AR-C155858 or AZD3965 did not impair either cell migration or invasion; importantly, they noted that these inhibitors did not affect MCT1 expression in the cells (12). From this latter point, Payen and colleagues hypothesized that MCT1 expression is in fact responsible for controlling cancer cell migration — and that its activity as a transporter is not (12). They subsequently generated a transport-inactive version of MCT1 and expressed it in cells in which they had deleted the active version of MCT1 (12). What they found upon doing so was that migration was restored in these cells, implying that MCT1’s promotion of cancer cell migration is indeed independent of its transporter activity (12). Following these results, they activated NF-κB in MCT1-deficient cells and found that cell migration ability was then rescued; when they treated these cells with a highly specific NF-κB inhibitor, the opposite effect was observed (12). All in all, these experiments indicate that MCT1 controls cancer cell migration through its connection to NF-κB. One final explanation for MCT1’s promotion of cancer cell activity is its relationship with the chaperone protein CD147. CD147 expression, which is elevated in carcinomas, is positively correlated with tumor recurrence and progression and negatively correlated with cancer patient survival (19). Because CD147 is essential for the transport of MCT1 to the plasma membrane, inhibiting CD147 expression disrupts the function of MCT1 — and, some have proposed, cancer cell activity as a result (10, 20). Others have suggested that the stable complexes that MCT1 and CD147 form with one another are a more significant factor in MCT1’s promotion of tumor cell progression (12). As CD147 has been found to activate NF-κB in cardiomyocytes and fibroblasts, some researchers have posited that these MCT1-CD147 complexes boost cancer cell activity through CD147-dependent activation of the NF-κB pathway (12). Overall, MCT1’s association with CD147 may add to its facilitation of tumor progression. MCT1’s ability to transport lactate and pyruvate, in addition to activate growth and transcription factors, may play a key part in the aid it provides to cancer cells. Further studies of the correlation between MCT1 and tumor progression may provide insight into the ways in which it can be used in a chemotherapeutic fashion. Already several attempts have been made to assess the effects of various MCT1 inhibitors on cancer cell metabolism (21). The case of AZD3965, a selective MCT1 inhibitor, illustrates the necessity of further research into MCT1’s facilitation of tumor development and progression. One study demonstrated that inhibiting MCT1 with AZD3965 activates glycolysis, resulting in intracellular lactate accumulation (22). But another study showed that AZD3965 does not affect glycolytic activity or lactate levels in cancer cells; instead, it appeared only to inhibit tumors through the disruption of pyruvate export (15). It seems that more work must be done in order to understand the metabolic changes induced by this inhibitor and any others, work that will be crucial in assessing their potential as chemotherapeutic drugs. The part MCT plays in cancer maintenance and progression also appears to vary depending on the type of cancer; conflicting results and lack of functional studies warrant additional investigation into the matter (10). In the future, more progress may be made with respect to targeting MCT1 as a means to halt tumor progression — and grasping MCT1’s exact role in this progression is the first step toward such progress. Halestrap, Andrew P., and Nigel T. Price. “The Proton-Linked Monocarboxylate Transporter (MCT) Family: Structure, Function and Regulation.” Biochemical Journal 343.2 (1999): 281-299. PMC. Web. 10 Oct. 2017. Halestrap, Andrew P. and Marieangela C. Wilson. “The Monocarboxylate Transporter Family — Role and Regulation.” IUBMB Life 64.2 (2012): 109-119. PMC. Web. 10 Oct. 2017. Gatenby, Robert A. and Robert J. Gillies. “Why Do Cancer Cells Have High Aerobic Glycolysis?” Nature Review Cancer 4.11 (2004): 891-899. PMC. Web. 10 Oct. 2017. Li, Chunxia et al. “Metabolic Reprogramming in Cancer Cells: Glycolysis, Glutaminolysis, and Bcl-2 Proteins as Novel Therapeutic Targets for Cancer.” World Journal of Surgical Oncology 14.1 (2016): 15. PMC. Web. 30 Oct. 2017. Liberti, Maria V. and Jason W. Locasale. “The Warburg Effect: How Does It Benefit Cancer Cells?” Trends in Biochemical Sciences 41.3 (2016): 211-218. PMC. Web. 30 Oct. 2017. Vander Heiden, Matthew G., Lewis C. Cantley, and Craig B. Thompson. “Understanding the Warburg Effect: The Metabolic Requirements of Cell Proliferation.” Science (New York, N.Y.) 324.5930 (2009): 1029-1033. PMC. Web. 30 Oct. 2017. Lunt, Sophia Y. and Matthew G. Vander Heiden. “Aerobic Glycolysis: Meeting the Metabolic Requirements of Cell Proliferation.” Annual Review of Cell and Developmental Biology 27.1 (2011): 441-464. PMC. Web. 11 Oct. 2017. Tannock, Ian F. and Daniela Rotin. “Acid pH in Tumors and Its Potential for Therapeutic Exploitation.” Cancer Research 49.16 (1989): 4373-4284. PMC. Web. 21 Oct. 2017. Izumi, Hiroto et al. “Cellular pH Regulators: Potentially Promising Molecular Targets for Cancer Chemotherapy.” Cancer Treatment Reviews 29.6 (2003): 541-549. PMC. Web. 11 Oct. 2017. Pinheiro, Céline et al. “Role of Monocarboxylate Transporters in Human Cancers: State of the Art.” Journal of Bioenergetics and Biomembranes 44.1 (2012): 127-139. PMC. Web. 21 Oct. 2017. Pinheiro, Céline et al. “Monocarboxylate Transporter 1 Is Up-Regulated in Basal-Like Breast Carcinoma.” Histopathology 56.10 (2010): 860-867. PMC. Web. 11 Oct. 2017. Payen, Valéry L. et al. “Monocarboxylate Transporter MCT1 Promotes Tumor Metastasis Independently of Its Activity as a Lactate Transporter.” Cancer Research 77.20 (2017): 5591-5601. PMC. Web. 11 Oct. 2017. Hirschhaeuser, Franziska, Ulrike G.A. Sattler, and Wolfgang Mueller-Klieser. “Lactate: A Metabolic Key Player in Cancer.” Cancer Research 71.22 (2011): 6921-6925. PMC. Web. 30 Oct. 2017. Walenta, Stefan and Wolfgang F. Mueller-Klieser. “Lactate: Mirror and Motor of Tumor Malignancy.” Seminars in Radiation Oncology 14.3 (2004): 267-274. PMC. Web. 30 Oct. 2017. Sun Hong, Candice et al. “MCT1 Modulates Cancer Cell Pyruvate Export and Growth of Tumors that Co-express MCT1 and MCT4.” Cell Reports 14.7 (2016): 1590-1601. PMC. Web. 10 Oct. 2017. Gray, Alana L. et al. “Monocarboxylate Transporter 1 Contributes to Growth Factor-Induced Tumor Cell Migration Independent of Transporter Activity.” Oncotarget 7.22 (2016): 32695-32706. PMC. Web. 10 Oct. 2017. Karin, Michael. “Nuclear Factor-kappaB in Cancer Development and Progression.” Nature 441.7092 (2006): 431-436. PMC. Web. 23 Oct. 2017. Zhao, Zhiqiang et al. “Downregulation of MCT1 Inhibits Tumor Growth, Metastasis and Enhances Chemotherapeutic Efficacy in Osteosarcoma Through Regulation of the NF-κB Pathway.” Cancer Letters 342.1 (2014): 150-158. PMC. Web. 10 Oct. 2017. Bovenzi, Cory D. et al. “Prognostic Indications of Elevated MCT4 and CD147 Across Cancer Types: A Meta-Analysis.” BioMed Research International (2015): 242437. PMC. Web. 13 Nov. 2017. Messeha, S.S. et al. “The Role of Monocarboxylate Transporters and Their Chaperone CD147 in Lactate Efflux Inhibition and the Anticancer Effects of Terminalia Chebula in Neuroblastoma Cell Line N2-A.” European Journal of Medicinal Plants 12.4 (2016): EJMP.23992. PMC. Web. 13 Nov. 2017. Beloueche-Babari, Mounia et al. “MCT1 Inhibitor AZD3965 Increases Mitochondrial Metabolism, Facilitating Combination Therapy and Noninvasive Magnetic Resonance Spectroscopy.” Cancer Research 77.21 (2017): 5913-5924. PMC. Web. 1 Nov. 2017. Bola, Becky M. et al. “Inhibition of Monocarboxylate Transporter-1 (MCT1) by AZD3965 Enhances Radiosensitivity by Reducing Lactate Transport.” Molecular Cancer Therapeutics 13.12 (2014): 2805-2816. PMC. Web. 1 Nov. 2017.